The Sue Ryder charity brought its new treatment to the Scottish Parliament on Tuesday for MSPs to experience. It operates Dee View Court, Scotland’s only specialist residential care facility for people with complex neurological conditions. New technology being trialled at the centre is being used to help people with conditions such as Huntington’s disease, multiple sclerosis and acquired brain injuries. Feedback has included a reduction in pain, lessened anxiety and a lowering of blood pressure levels. Lewis Macdonald MSP, who invited the charity to Holyrood, said: “When you see for yourself the kind of innovative things that are happening at Dee View Court, you can see why that would be really beneficial for other people in other places. “Even in Aberdeen, the success of Dee View Court has been such that they’re doubling the number of rooms because there is such high demand in that one area. The system was developed by tech company Immersicare. Users place a headset over their eyes and ears and are virtually transported to a different location, where their body movements adjust what they see. It can allow residents to find themselves in places they may not be able to visit, such as the beach, jungle or outer space. 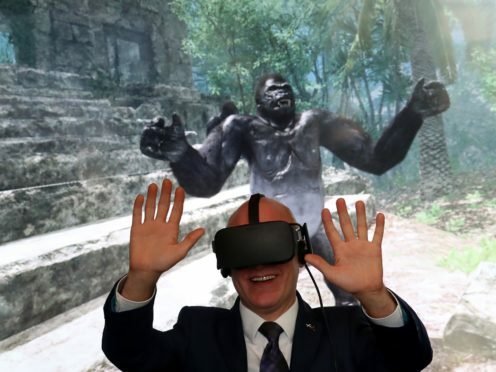 Joe FitzPatrick MSP was among the politicians to try out the technology, which saw him transported to a famous location he has previously visited. Speaking from beneath virtual water level, the Minister for Public Health and Wellbeing said: “It reminds me of being in the Red Sea, which I swam in once. He added: “The use of virtual reality technology to help people with neurological conditions is a great example of innovation in health and social care. “I commend Sue Ryder for this and the wider work they do in supporting people living with these conditions. Politicians were given the chance to experience the therapy ahead of the of Scotland’s first ever National Action Plan on Neurological Conditions. Draft proposals are due to be published in the coming weeks for public consultation. Sue Ryder’s technology is now being rolled out across its other centres in the UK, due to its success. Pamela Mackenzie, director of neurological services for the charity, said: “People who have got pain have said they have got reduced pain, people who don’t sleep well – their sleep patterns have improved, people who are sometimes agitated with their condition are much more relaxed after a therapeutic session with the virtual reality. “It also helps people who have got memory impairment due to their condition as well. “Some memories are triggered with virtual reality, taking them back to a setting perhaps they have been in when they were younger or before the condition impaired them.